Motorcycle injury attorneys and the staff of Associates and Bruce L. Scheiner, Personal Injury Lawyers, have teamed up with the Southwest Florida Chapter of American Bikers Aimed Toward Education and Harley-Davidson/Buell of Fort Myers for the 2008 holiday run to the Gulf Coast Center – a state home for challenged adults in Buckinham. The firm has been teaming with the motorcycle club to put on the event for more than 20 years. With about 1,000 friends – more than 600 motorcycles made the drive last year from Fort Myers Harley Davidson to the Buckingham facility with presents strapped to their bikes, including Lee County Sheriff Mike Scott, Florida Senator Dave Aronberg and attorney Bruce Scheiner. Mayfield said many of the residents have no family in the area. 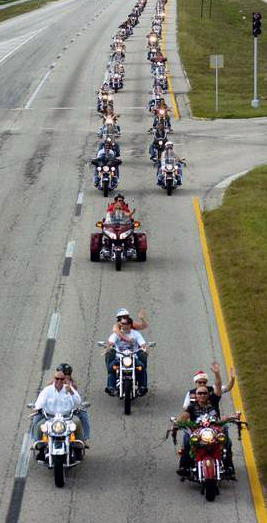 The Motorcycles depart Fort Myers Harley-Davidson on Colonial Boulevard at 12:30 p.m. on Sunday Dec. 14, 2008. Registration begins at 10:30 a.m. Participants are asked to bring gifts to brighten the holidays for the 50 men and 30 women of the home. Presents may also be dropped off anytime at Harley-Davidson/Buell of Fort Myers, 2160 Colonial Boulevard, Fort Myers. –	Adult sleepwear and slippers –	Pillows, blankets –	Bath towels –	Shoes, shirts, blouses, dresses, pants, socks and watches –	Games and arts and craft items –	CD Players and radios –	Dental floss, brushes, toothpaste and toothbrushes –	Other personal care items like cologne, deodorant, etc. The home respectfully requests people not donate stuffed animals or other toys as they are not age appropriate. 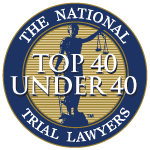 Associates and Bruce L. Scheiner, Personal Injury Lawyers, has been representing victims or car, truck and motorcycle accidents, as well as drunk driving victims and other personal injury cases in Southwest Florida for four decades. The firm offers free appointments to discuss your rights at any of its offices in Fort Myers, Cape Coral, Naples, Port Charlotte, Arcadia, Sebring and Venice.